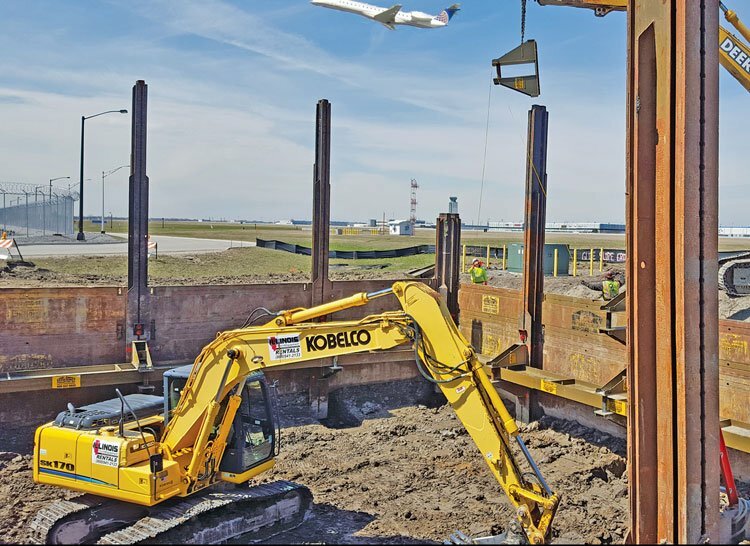 Underground utility contractor Midwest REM, based in Melrose Park, Ill., recently completed casting-in-place a new storm water pump station at O’Hare International Airport. The new pump station is a subproject of the multiyear, multi-million dollar O’Hare Modernization Program. The 7,500-gpm structure measured 60 ft wide, 60 ft long and 35 ft tall. Adding to the excavation project’s already challenging parameters was the fact that the behemoth pump station needed to be tucked-in between an adjacent road and a nearby active runway. Surprisingly, however, the limited space around the excavation site was not the biggest challenge facing the contractor. Midwest REM needed a safe and cost-effective shoring alternative to tight sheeting or open-cut. To accommodate the project’s height restrictions, Midwest REM chose an Efficiency Production manufactured Slide Rail System with integrated guard rail to shore the large excavation. 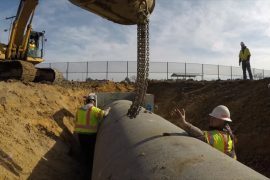 With tight sheeting ruled out, Murphy called local shoring equipment distributor Trench Plate Rental to inquire about using an Efficiency Production-manufactured Slide Rail Shoring System. “We chose Slide Rail because it was the only shoring system that would work with the limited space between runways and roads and flying planes,” says Murphy. Efficiency’s Universal Slide Rail System is a component shoring system comprised of steel panels — similar to trench shield sidewalls — and vertical steel posts. 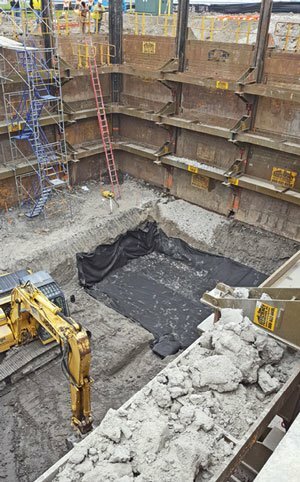 When installed, the versatile system creates a safe, obstruction-free shored excavation. Efficiency’s ClearSpan System uses the universal Slide Rail components to shore large excavations with dimensions as large as 60 by 60 ft or more. In a linear multi-bay configuration, long pipelines can be shored with a set number of Slide Rail components, which is a significant cost savings when installing pipe or other utilities over great distances. Midwest rented enough Slide Rail equipment to install a 63- by 63- by 32-ft ClearSpan Slide Rail System. Slide Rail is installed simultaneously as the trench or pit is excavated by sliding the panels into integrated rails on the posts — an outside slotted rail first, then an open-face rail on the inside — then pushing the panels and posts incrementally down to grade as the pit is dug; a process commonly referred to as a “dig-and-push” system. 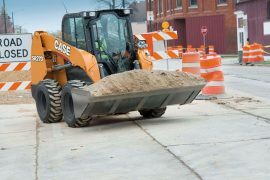 A John Deere 624 wheel loader that supplied the excavator with Slide Rail panels and other equipment while also moving dirt away from the excavation. James McRay is the director of marketing and media for Efficiency Production Inc. Founded in 1994, Midwest REM is a Chicago-based minority contractor. Midwest REM was subcontracted for this project by Chicago-based general contractor Kenny Construction. The engineering firm was DH Charles Civil Engineering. With offices in Chicago, Texas, Florida and California, Trench Plate Rental is an official Efficiency Production Inc. distributor. Check out www.tprco.com for more information. 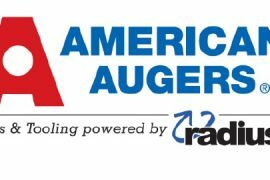 Efficiency Production, “America’s Trench Box Builder,” provides one of the widest selection of standard and custom trench shielding and shoring systems. 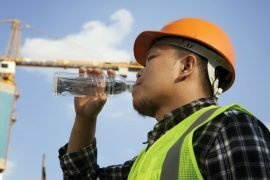 Efficiency’s versatile products are designed specifically for the safe and cost-effective installation of utility systems and infrastructure improvements. All products are P.E. certified to meet OSHA standards. For more information, call 800.552.8800 or visit www.efficiencyproduction.com. 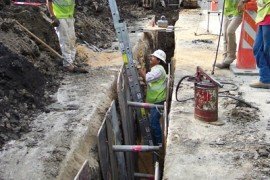 For more information on trench shoring and trench shielding, click here.